Will Ferrell and Tobey Maguire star in Spoils of Babylon miniseries, reviewed. Like The Thorn Birds, but funny on purpose. 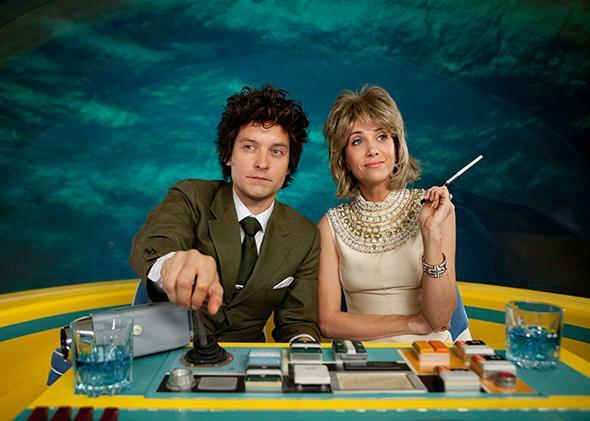 Devon Morehouse (Tobey Maguire) and Cynthia Morehouse (Kristen Wiig) in the comedy miniseries The Spoils of Babylon. One of the most pleasant ancillary effects of TV getting all good and respectable these days is that now movie stars are willing to do it. If TV is good enough for Dustin Hoffman, it is good enough for everyone else. TV’s new respectability underpins IFC’s new, strange, zany, funny, and very star-studded six-episode series The Spoils of Babylon, which premieres on IFC Thursday night. Created by former Saturday Night Live writers Matt Piedmont and Andrew Steele, Spoils is a completely anachronistic spoof of Orson Welles and grandiose miniseries like The Thorn Birds. It features Tobey Maguire, Will Ferrell, Kristen Wiig, Tim Robbins, Val Kilmer, and Carey Mulligan’s voice, all having a lark—and that’s just in the first two episodes. Jonrosh’s epic tells the story of Devon Morehouse (Tobey Maguire), a young foundling taken in by wannabe oilman Jonas Morehouse (Tim Robbins) and his daughter Cynthia (Wiig) in the middle of the Great Depression. The Spoils of Babylon is both a loving and completely silly send-up of a certain sort of dead-serious period piece, full of bad acting, over-the-top twists, and a swelling score. (It’s also, a little weirdly, a send-up of Wes Anderson: Piedmont, who directed, mimics many of his shots and twee detailing.) As the movie within the TV series begins we see that it is filmed in “Breath-take-o-scope,” and that each character has been given not one, but two ridiculous names, which I will not ruin for you except to say that Jessica Alba stars as Dixie Melonworth playing Dixie Melonworth. In the first episode, Jonas finally strikes oil (in a scene quoting Giant) just as the bank is foreclosing on him. In response to their characters’ good fortune Maguire and Robbins do a completely ridiculous chicken dance. Ferrell’s Jonrosh is not in most of the movie-within-the-TV-show (Jonrosh will appear in a later episode, as the Shah of Iran, no less), but Ferrell’s style of humor—which is also Piedmont and Steele’s—is everywhere, as that chicken dance demonstrates. The Spoils of Babylon features characters of immense silliness and self-absorption, who nonetheless feel things extraordinarily strongly, making them almost sweet despite themselves—a description of nearly every character Ferrell has ever played. Wiig’s Cynthia, who is in love with Devon, has a wonderful scene in which she fights with Devon’s new wife at the breakfast table. The wife is played by a mannequin voiced by Carey Mulligan, but she still sends Cynthia into an absolute rage, which she expresses by cutting her food into smaller and smaller pieces. Spoils also wrings innumerable jokes out of unexpected pacing. The most anachronistic thing about old miniseries, of course, is that they took their time. Jonrosh’s introductions again and again demonstrate Ferrell’s mastery of the long pause. The second installment’s war scenes are “based on my own terrifying experience,” Ferrell says, and then there’s a long silence before he adds, “reading about the war as a child.” Later, as Devon’s WWII fighter plane dives into the Pacific, he gives a long, searching speech about the nature of love, completely unconcerned about his imminent crash landing. But if past made-for-TV movies didn’t know when to cut it short, this one does. For all its riffs on length—on the pomposity of a guy who makes a 22-hour movie out of his way-too-long book—each episode of Spoils of Babylon is just about 22 minutes long, which is perfect. Old, extravagant miniseries are funny, but only if you don’t have to suffer through every minute of them.